Yep, that’s it, unfortunately. While it’s not truly groundbreaking news, it’s still nice to have some kind of confirmation on just who might be in “Avengers: Infinity War”. 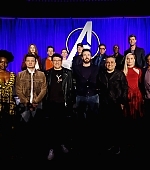 As we know, the movie will supposedly feature nearly the entire cast of Marvel’s Cinematic Universe, so getting to narrow it down – even by one – is very much appreciated.